Access for 1 (one) to the annual Nashville Halloween Pub Crawl on Saturday October 26. The largest city and capital of Tennessee, Nashville is filled with country music pride. It's no wonder that it has been dubbed the "Music City U.S.A.". The Country Music Hall of Fame and Museum isn't the only hot spot attraction in Nashville - Pub Crawls are here too! With so many choices of pubs and venues in the beautiful city of Nashville, it is a prime destination for bar crawling. What better time to scour the town than Halloween?! One of the largest party holidays of the year is coming full force to Nashville. 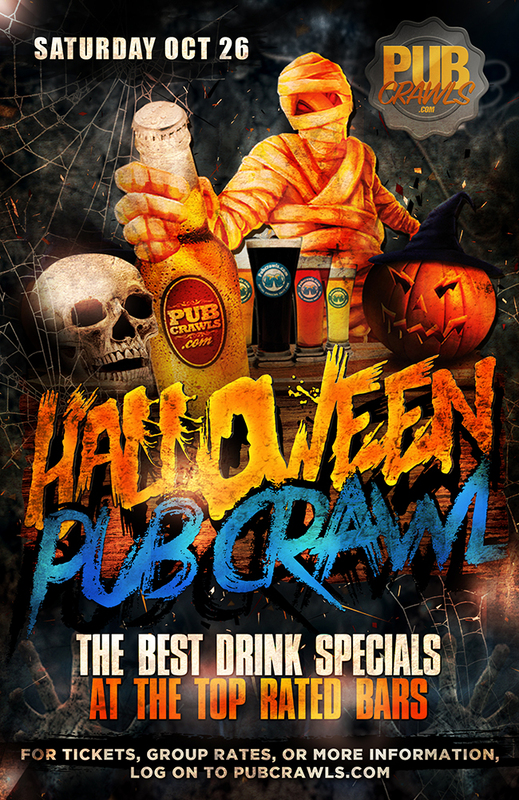 Don your wildest costumes while visiting some of the swankiest pubs in town - all while enjoying drink specials and a map-guided bar route created for convenience. Nashville residents know very well what the capital of Tennessee has to offer. This Halloween, let's bring out the true party goers and put this city back on the fore front of Southern nightlife hospitality. We have so much pride in our history and our people - HalloWeekend is the perfect moment to capture its excitement. Fall is the time of the year we always seem to dread. The summer has ended and cool weather is approaching. However, Halloween is undoubtedly one of the bright spots of the Fall season. The leaves are falling, the weather is crisp, and the monsters are crawling the streets looking for spooky times. Explore Nashville with us this year and partake in the largest bar crawl event in the South.